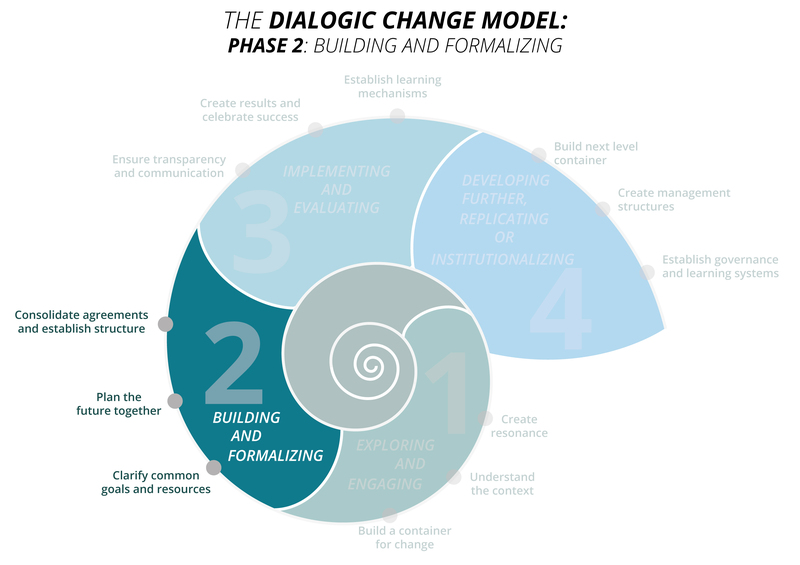 Phase 2 of the Dialogic Change Model is geared towards consolidating the system of stakeholder collaboration and formalizing stakeholders’ commitment to change. In this phase initial structures are developed, project teams defined and regular meetings planned. This usually leads to agreements – the signing of a contract, a memorandum of understanding, a project plan or a public address in the interest of the change endeavor. With an official event and an agreed–upon, written document, the Stakeholder Dialogue officially comes to life. Also at this stage it is crucial to strengthen the work of the core group of initiators (we refer to this group as the container). The 4C project is a cross-sector partnership between coffee traders, producer organizations and international civil society organizations that aims at improving conditions for all participants of the coffee value chain. In Phase 1 the promotion of the idea took place informally: alongside international conferences relationships were built and people became convinced that the ambitious idea was worth pursuing. But after the many informal discussions had shaped the idea, the 4C initiative needed a formal “home”, a structure clear enough for all to engage on a regular basis. The industry side mandated the coffee association to become the driving force of the initiative as it represented a variety of coffee trade and industry. They decided to contribute a team member to the project secretariat. The public side also seconded a small team into the project secretariat. The secretariat´s task was to broker cooperation by facilitating communication, consensus building and effective decision making. In the now much more formalized rounds of conversations the project was conceptualized, planned and budgeted. The process of tri-partite participation was discussed more in detail and jointly presented to relevant committees. It was also presented to a first round of stakeholders, improved in the basis of their feedback and adjusted accordingly. The service orientation of the project secretariat turned out to be one of the most important measures to build trust and stable relationships. It enabled the team to have direct contact to most of the stakeholders. Potential conflicts or misunderstanding could often be cleared informally. Each stakeholder group decided upon a representative who functioned as a reporter, easing the communication within the stakeholder-group and between the group and the project secretariat. Remarkable was that the more individual participants began to identify with the intention and goal of the initiative the more they were able to create fields of resonance within their respective organizations. So what about your project? Have you navigated sucessfully from the informal stage to a more structured set up? To find out if you have considered the most important aspects of Phase 2 I invite you to have a look at our online tool for phase 2 – giving you the possibility to assess your progress and get recommendations on what needs to be done in order to create the conditions for your Stakeholder Dialogue to step into the next phase of engagement.